Last week, Telegram made its transition from being an instant messaging app, into a proper VoIP (Voice over Internet Protocol), to take on WhatsApp and other such services. 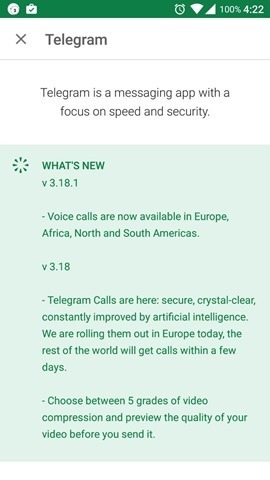 The bad news was, Telegram's voice calls were limited to Europe, temporarily. We are not sure if the service wanted to test the voice calls, in its home continent, but the soft launch seems to be over already. Telegram voice calls are now available in North America, South America and Africa. No official was made for this release, but the Play Store changelog for Telegram’s latest version, does mention the availability in the new regions, But for some reason, the iOS version does not have the same supported in it yet. Still, that's four 4 out of the 6 populated continents, that the service is available in for Android, and we think it may not be long now, when Telegram voice calls are launched for the Oceanic region (Australia, New Zealand), India and the rest of Asia. Make sure you are using Telegram version 3.18.1 or above for the voice calls to work. You can download the latest version of Telegram from the Google Play Store and the Apple iTunes App Store.